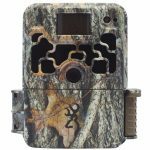 The Bushnell Powerview 20×50 Binoculars provide a pretty serious amount of power at an attractive price. 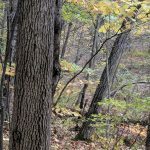 Making the right decision about a pair of binoculars involves deciding what you are looking for. There is no universally ‘perfect’ set of binos. We will cover the main features of the 20x50mm version of Bushnell’s Powerview binoculars. We will look at what’s good about them, and what might not be so good. Then, we will give some guidance about who these binoculars will be a great choice for. Use the table of contents below to jump right to a feature you are specifically curious about or else read on while we take a closer look at the 20×50 Powerview binoculars. 1.9 Our Verdict: Who are these right for? Bushnell have been leaders in the world of sports optics for more than 65 years. They have a great reputation for making high quality products, and their binoculars are where they really have built their reputation. Bushnell have created a wide range of binoculars that will meet the needs of all types of people, from hunters to birdwatchers, to sports fans and people looking to get a better view of the world around them. Let’s start with the lenses. The optics are BK-7 prism fully multi-coated. When you look through the Powerview binoculars you’ll see a bright and high contrast image, that has great depth. The multicoated Porro prism allow for excellent light transmission through the lenses and will allow you to see the details of animals (or whatever you are using these for) with a definite clarity. The optics, along with the focus system make it easy for you to hold the target steady while you are observing it, even with movement you will get a super crisp image with the 12×50 Powerview binoculars. The aperture, or exit pupil is 2.5mm, which is a fairly large size. The exit pupil determines the amount of light that is getting into the binoculars, and is responsible for being able to see your subject better in low light with the binoculars than with the naked eye. This is what some reviews call this camera’s ‘night vision’, which isn’t really night vision, more like enhanced dusk and dawn vision. The optic system on these binoculars give you a great view of your target even with low light. The 12×50 Powerview Bushnell binoculars offer a high level of surveillance with the field of view. Surveillance here being used to in a broad sense of being able to survey over a large area, instead of the more common definition of security surveillance. You’ll get a field of view of 170 feet when viewing at a 1000 yards. This is a good field of view for a set binoculars with this level of magnification. Of course, with a lower level of magnification you will get a large field of view, but you’ll be trading off the detail of what you’ll be able to see for the scope. This is one of the areas where you’ll have to decide what you are looking for in a pair of binoculars. For example, the 12x50mm will give you great details if you are looking at small birds, but it could be harder to initially find those small birds with the higher magnification. If you are new to choosing binoculars, the 20 in 20×50 stands for the magnification power. So for this model, the magnification is 20 times. To understand what this means, is if you are looking at something so 100 yards away, when you look at it through these binoculars it will look as if it were only 5 yards in front of you (divide the distance by the magnification). With higher magnification binoculars you should keep in mind that they will have more problems with focusing on objects that are close to you. The 20x50mm have a close focusing distance of 45 feet. Anything closer than 45 feet is going to appear blurry. When you go up in magnification you get a better image of your subject at greater distances, but you also risk having difficulty seeing your subject clearly if there is any shaking or movement to your binoculars. Think of the small movements being also magnified. The Powerviewer line of Binoculars helps to counteract this problem with its Insta Focus system. 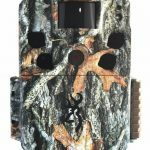 This one touch lever allows you to easily keep your subject in focus at long range distances, even if there bird or animal is moving. There are some reports of people having trouble with the focus, or having double vision through these binoculars, but they seem to be reported in a small number, that this could just be a defect in the particular set of binos they bought, or maybe a user problem. Since your own hand movements, or shakiness can effect the focus, it’s important to decide if the binoculars weight will be a problem for you to hold comfortably. The 20x50mm weight 30 ounces (just under two pounds), so you’ll have to decide for yourself, is that something I can hold steady for the time I want to be using them? They do come with a place to screw the binoculars on to a tripod, which can be another option to achieve a better steadiness in focus… again, though depending on how you are mainly planning to use your binoculars. Bushnell Powerview Binoculars have a sleek modern design. They use high quality materials and body is covered with a nonslip rubber armor. The rubber shell can help absorb shock during a fall, and it also provides a good grip on the binoculars, especially for hot and humid days when sweat on your hands can cause problems with keeping a good firm grasp on your binoculars. The dimensions of the binoculars are 5.5 inches Length, 4.25 inches Width and 2 inches High (5.5″L x 4.25″ W x 2″H) and they weight 30 ounces. The eye-relief can be a bit of a problem for some people. The eye relief is listed as 9mm, which can cause problems, such as a decreased field of view for people who wear glasses while using their binoculars. There are also some reports of the Viewfinder binoculars not being great for people with narrow eye widths. The best thing you could do if you think that you might have one of these two problems is head over to a sports or outdoor store to try them out and see if they will work with your particular needs. One drawback on the design and durability that you want to be aware of when making your decision. These binoculars are not weather or fog proof. There are other models that will stand up much better to being used in the rain. They also aren’t waterproof, so care should be taken that you don’t drop them in water. These might not be the best binoculars for you if you are using them for something like whale watching, or you are an all-weather adventurer looking to see the wildlife. 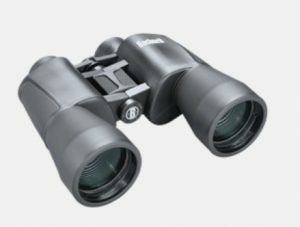 Putting aside all the technical aspects of these binoculars, what a lot of people are going to find attractive about Bushnell’s Powerview series of Binoculars are the price. Any of the models have an MSRP of under $100, and can usually be found new at a significant savings. For the power and high quality durability, the price for the Powerview binos is amazing, and puts an excellent pair of binoculars in the range of someone who doesn’t want to invest a ton of money in them. When you purchase the Powerview 20×50 Binoculars you get the binoculars, along with a nice soft case and a not so nice strap. The case is light and perfect for carrying it in your backpack with adding any bulk or weight. Depending on how you plan to use the camera you may want to invest in higher quality case, but for most people the case it comes with should be more an adequate. The same can’t be said of the strap. If you use your strap regularly with your binoculars you will probably want to change out the strap it comes with for one that is higher quality. It’s never good to end up damaging your binoculars because of a cheap strap. The online reviews for Powerview binoculars are generally very positive. When we looked at online reviews we tried to only focus on customers who had purchased the 20x50mm model. The biggest complaint people had was with the loose focus wheel, which we think might be a complaint of an earlier model, since the newest Powerview’s come with the Insta Focus lever instead of the more traditional center focus wheel. Some customers experienced a double vision with their binoculars, and had trouble adjusting the Interpupillary Distance to accommodate narrow eye widths. There was also some concern over the quality of the strap and a few people pointed out that the eye caps had trouble staying securely on the binoculars. Getting the negative comments out of the way, lets get to the positive! People generally had great things to say about these Bushnell binoculars. The image quality was repeatedly raved about, and they are generally considered to be a good long range pair of binoculars. People also were happy with the Insta Focus lever and found it be very convenient and easy to use. One reviewer even described how they were able to use the binoculars along with the camera on their phone to get a sharp photograph of a road sign more than 1.5 miles away. Our Verdict: Who are these right for? 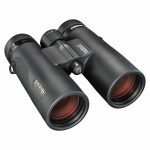 We like this pair of binoculars and recommend it for anyone looking for a good quality set of long range binoculars for casual use. For regular nature viewing, bird watching or hunting these can be exactly what you are looking for at a very affordable price. Because they aren’t weather or fog proof, we wouldn’t recommend them for the more adventurous, rain or shine type of user. There are much better binoculars you could choose that will suit your needs better than the Powerview series. We think of these as perfect for the casual user who wants to get out to nature on a nice day, or is looking to use binoculars to see a sports game from the noose bleed seats. 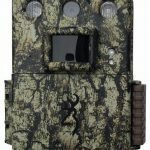 For a beginner looking to purchase their first long range binoculars these would also be great. If you just starting out with a pair of binoculars, we think you should make sure that the 20x50mm are the right strength for you. We discuss this in more detail in other places, but just keep in mind that the viewing distance with this pair of binoculars starts at 45 feet, so if you were going to use these to watch birds in your backyard, you might want to look at less powerful optics that will be better suited for what you are primarily going to be using them for. Bushnell makes high quality binoculars, and they have a reputation for great customer service. The binoculars come with a limited lifetime warranty. They can feel confident that if something does go wrong with the binoculars you will have no problem getting excellent assistance, which we also recommend over some of the unknown brands that you can find while doing a search for a pair of binoculars online. Click here to find the current low price for the Powerview 20×50 binoculars.